Home » Portfolios » Intermedia Touch implemented an interactive aquarium at Nicklaus Children’s Hospital ER in Miami, FL. 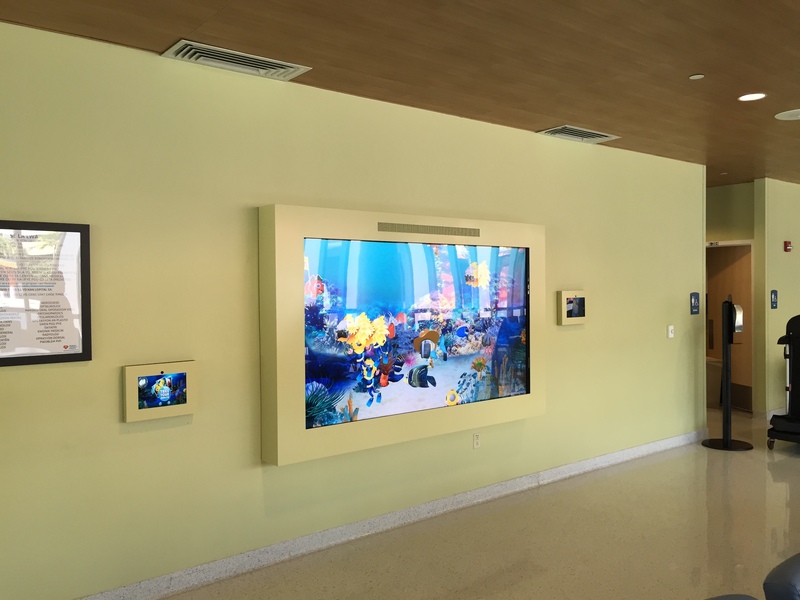 Intermedia Touch implemented an interactive aquarium at Nicklaus Children’s Hospital ER in Miami, FL. The systems involve two tablets coupled with an interactive, high definition 90” display. The monitor displays an interactive aquarium called “Shell-fie,” that enables users to take their picture and have it graphically placed on a chosen fish in the aquarium. The objective of this project was to provide the children and their families visiting the Miami Children’s Hospital emergency room, with a fun distraction when dealing with health issues and injuries. 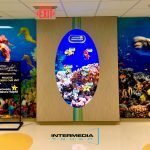 By working closely together with the hospital, Intermedia Touch created an interactive aquarium with sea life that reacts hilariously with every touch. The main issues when dealing with a system in place at a children’s emergency room involve durability and sanitation. 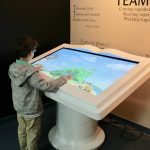 Children may attempt to hang from the mounted tablets or may hit the touch screen aquarium with more force than a typical touch surface, used in other venues. Likewise, the location has a high risk to be unsanitary at times. The challenges involved in creating digital signage for a children’s ER were overcome by building an enclosure that utilizes durable materials that can withstand abuse. The monitor itself is covered by gorilla glass, and the entire system is enclosed with ventilation in a region that is inaccessible to children. The enclosure, while protecting from physical damage, also allows the hospital staff to easily sanitize the interactive surfaces. This project shows a general shift in waiting room happiness. The children are excited to play with the aquarium. The “Shell-fie” application also helps the families who visit the hospital lower the overall stress of the situation by entertaining the sick or injured children.